When my son and I and a co-worker of his arrived at the Yosemite entrance gate it was dark. A big electronic sign on a trailer was parked to the side of the empty ranger kiosk. Its message alternated between “PARK CLOSED” and “DUE TO GOVT SHUTDOWN.” The fluorescent lights were on at the restrooms. We slowed, looking for someone to tell about our special circumstance. We’d practiced our spiel on the drive: “We’re with Anderson Burton Contractors here for the cabin lifts at Curry Village.” It had the advantage of being the truth. Still, it wouldn’t do to stumble over the words at the key moment. Seeing no one, we continued into the park. 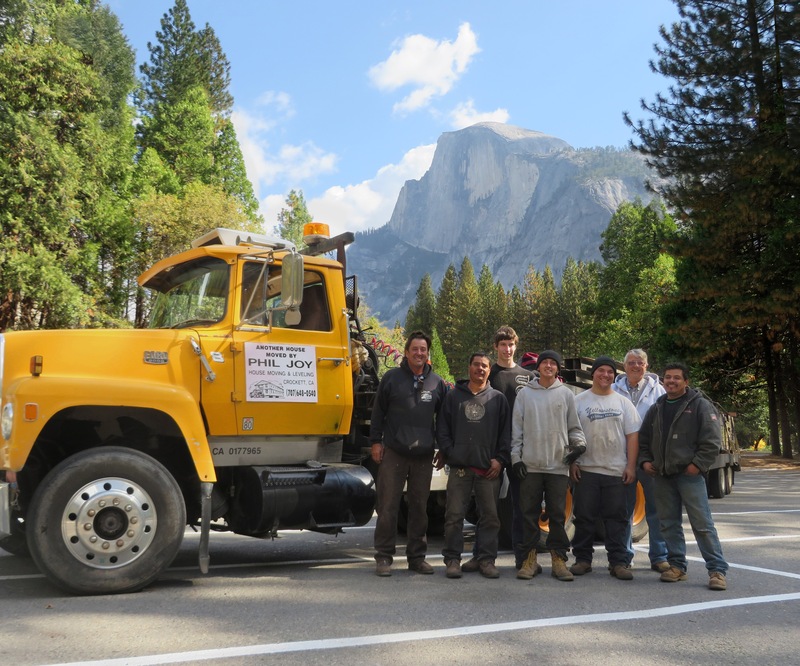 I had been invited by Phil Joy to tag along on a work weekend at Yosemite Valley where he and his typical crew of six workers that included my son would be setting down some of the hundred year old cabins onto new foundations in Curry Village. I’m a big fan of Yosemite (a.k.a. John Muir’s Great Temple – a title that works for me), but I didn’t want to make such a trip just to watch other people work. Plus, we would be going up on a weekend during the government shutdown and that seemed somehow ominous. 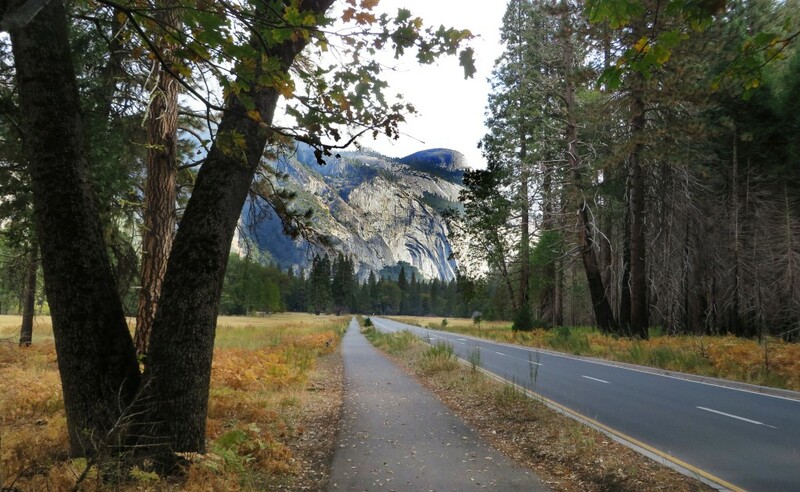 About a half a day later I finally began to understand exactly what that stupid shutdown would do for this trip – it was a chance to experience Yosemite Valley without people in it. Truly once-in-a-lifetime stuff. I wanted in. Since the eateries in the Park would be closed, I asked Phil and Celeste if I could help out by preparing meals for the work crew. In this way I would “earn my keep” as a contributing member of the team, and still have plenty of time between meals to head out into the unpopulated valley. So I packed an ice box full of food, as well as my backpack tent and sleeping gear and loaded it all into my son’s car. After passing through the abandoned entrance gate with the surreal electronic sign, we drove the miles up and then down into the valley. We had not seen a soul or even a moving car for the last hour of driving. The turnoff to Bridal Veil Falls had a “road closed” sign, so we continued to drive up the valley through the forest. After half a mile, I couldn’t stand it. I had to get out of the car and experience the reality of where we were. I asked Wesley to pull over and we got out and walked between the dark silhouettes of the pine trees until we had a clear view of the enormous rock face of El Capitan, looming so huge in the dim silver light of the half moon. All was silent. Overhead the nighttime sky brimmed with stars. It all felt so peaceful and void of human energy. We stood there, quietly taking it all in. Yes, we had the valley to ourselves. Several miles of driving later, we arrived at our worksite at the far end of the valley in the cluster of cabins and cabin-tents called Curry Village. It was there my dream of being solo took a hit – there were people here. Quite a few, actually. This was where the park employees were waiting out the shutdown. As I would discover over the next two days, they were all content to stay in Curry Village, thus leaving the other ninety-five percent of the valley almost completely empty of people. Visions of setting my tent on the lawn of the Ahwahnee Hotel, or on the riverside at Housekeeping Camp with a view of Half Dome, were replaced with the more practical solution of making camp next to Phil’s big flatbed truck loaded with tractors and such. It would make us as legitimate as possible. As a backpacker of many years, it was easy setting up the ol’ Sierra Design tent in the dim light of a nearby streetlamp. Then I noticed a group of three rangers standing together in the distance next to their three ranger cars, just watching us for several minutes as we made a point of going about our business as un-guilty looking as possible. When they walked up and questioned us, we got to use our spiel on them. That worked to validate us, but the older ranger sure didn’t like the way we were improvising our accommodations like this. Since nobody had a better idea, we were begrudgingly allowed to stay. I was up at seven the next morning to get breakfast started on a big camp grill Phil set up next to his camper. I scrambled eggs, Phil fried bacon, Celeste did the rest, and a hearty breakfast was produced for the boys. After clean up, I was free to explore. As soon as I left the Curry Village area, the number of people fell to almost zero. At least it felt that way. I could hike on a trail near the main road and not experience another human or car for ten minutes or more. Even when rangers drove by, they didn’t seem to care about random hikers. 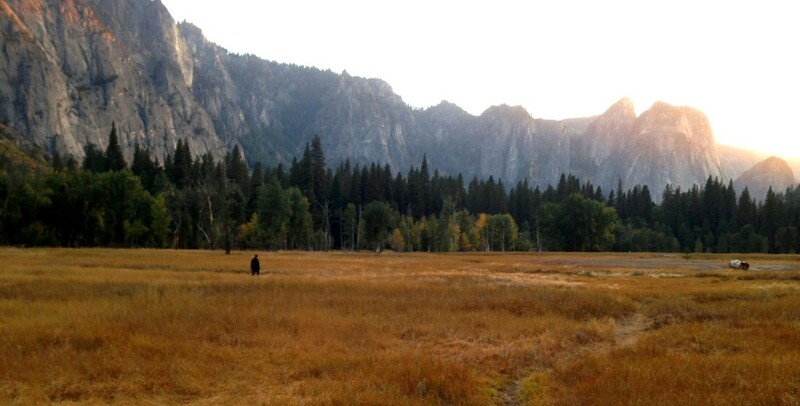 A favorite spot was Leidig Meadow with its view of the spectacular granite cliffs both up and down the valley. For lunch, Celeste and I laid out a big array of fixings for sandwiches. The guys showed up in their hard hats, grubby but happy that they had already managed to lower three out of the five cabins. The food got good reviews too. All of us were pretty happy with how our day was going. That afternoon and the following morning before we pulled out, I made sure to get in my explorations. On those few occasions when I would pass by another soul doing the same thing I was doing, we would never acknowledge each other – not even eye contact – because it was simply understood that we all wanted to keep our solitude intact. Truth is, being alone in a beautiful setting like that wasn’t much different from a good afternoon backpacking, except for the fact that I happened to be in the crown jewel of wilderness locations. What was the better way to enjoy this unique situation? By focusing on the idea of how rare it was to have this place to myself and then prop my camera on a log to take a “selfie” of myself in that setting, suitable for bragging? Or to simply stay in a sort of Muir-like reverie and appreciate the beauty? It was the same dilemma of the social media generation – do you climb the mountain to see, or do you climb it to be seen? Before we left on Sunday I took one last visit to Leidig Meadow. Some trees had riotous yellow and red colors. The big waterfall at Yosemite Falls was dry, and much of the Merced River was placid like a pond. All typical of autumn. Birds were the prevailing sound – the occasional trills and caws. I was happy to have had the chance to see the place in this mode, but honestly, this sort of peace is available as soon as you get off the beaten paths. No government shutdown required.